According to the Democrats, the round of mandatory spending cuts required by the sequester are like a meat cleaver slashing away at needed programs. If you didn’t do your job, you’d be fired. But when Eric Cantor and John Boehner don’t do their jobs, two million Americans get handed pink slips. Right now, House Republicans are refusing to even vote on the sequester. If they do nothing, a meat-cleaver will chop away, almost indiscriminately, at essential domestic programs and make life even harder for millions of Americans. If we go over the sequester cliff on March 1st, two million jobs could be lost — including law enforcement, first responders and teachers. Essential programs for pregnant women, children and domestic abuse victims could shut their doors. And the economy could be thrown back into a recession. I only wish they were using a meat cleaver to cut the budget. We badly need to take a cleaver to cut spending. As it happens, the deep sequester cuts are really only cuts in the rate of spending, not actual cuts in spending. Even so, the cuts are hardly deep at all, as Veronique de Rugy explains. Changes in spending from sequestration result in new budget projections below the CBO’s baseline projection of spending based on current law. The federal government would spend $3.62 trillion in the first year with sequestration versus the $3.69 trillion projected by CBO. By 2021, the government would spend $5.26 trillion versus the $5.41 trillion projected. Overall, without a sequester, federal spending would increase $1.7 trillion (blue line). 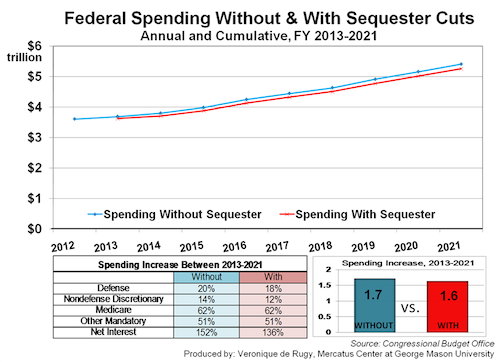 With a sequester, federal spending would increase by $1.6 trillion (red line). A further breakdown of the percentage of budget programs reveals that sequestration provides relatively small reductions in spending rates across the board. With sequestration, defense increases 18% (vs. 20%); nondefense discretionary increases 12% (vs. 14%); Medicare roughly increases at the same rate; and net interest increases 136% (vs. 152%). While the sequester projections are nominal spending increases, most budget plans count them as cuts. Referring to decreases in the rate of growth of spending as “cuts” influences public perceptions about the budget. When the public hears “cut,” it thinks that spending has been significantly reduced below current levels, not that spending has increased. Thus, calling a reduced growth rate of projected spending a “cut” leads to confusion, a growing deficit, and an ever-larger burden for future generations. Here is the graph that went with that article. The so-called deep cuts that will endanger the country and put millions out of work are hardly more than a statistical error. It wouldn’t be an exaggeration to say that Obama and the Democrats are simply lying when they describe the spending cuts as indiscriminate. If anything they are not nearly deep enough. There seems to be a certain unreality in both parties of our political class. The Republicans know there is a problem and that we cannot continue to run up astronomical deficits every single year. They are so afraid of being cast as the villains who want to cut the budget to hurt the poor and provide their rich friends with tax cuts that they are afraid to make anything more than symbolic cuts in the rate of increase of spending. They are right to be wary since that is precisely what the Democrats, with their allies in the media will do, regardless of the Republican position. The Democrats, for their part, refuse to admit that there is any problem with spending that raising taxes on the 1% won’t solve. President Obama is not in the least interested in cutting spending. He seems to be more interested in redistributing the wealth of the country in ways that he considers fair than in maximizing revenue. In fact, it may not be too cynical to imagine that Obama has been deliberately increasing the deficit in order to justify the higher, fairer taxes he craves. Since no one in Washington cares to do their job, managing the resources of the government in a responsible fashion, then I think the best bet is simply to let the sequestration cuts go ahead. There may well be people hurt by the “cuts” but we have to start cutting the budget sometime. There will be a lot more people hurt if the federal government has to start defaulting on its debts or the dollar loses its value. As far as I am concerned the blame for anyone being hurt by spending cuts lies on the people who encouraged dependency with no regard for how unsustainable this sort of spending would be in the long, or even medium term. This entry was posted on February 25, 2013 at 6:10 pm and is filed under Economics, Politics, What's Happening. You can follow any responses to this entry through the RSS 2.0 feed. You can leave a response, or trackback from your own site.